The first ever official timed table Tantrix tournament was held on Saturday 4 May to find a winner for the cup shown below left. It was part of the 2nd provincial Mind Sports Olympiad event held at Parkside Community College, Cambridge. 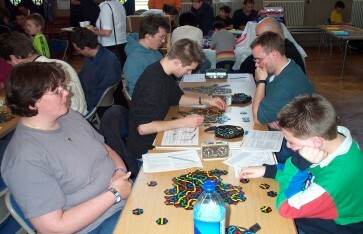 Tantrix shared the main hall (where it was the biggest tournament) with various other games, including an England v Czech Republic draughts match. The Tantrix sets on the non-tournament tables were popular with the other MSO players all day but, not surprisingly, only Matthew Reid was brave enough to learn the rules and enter the tournament on the day without having seen Tantrix before. Matthew joined World Junior Champion Simon Wright who had flown in from Belfast, Derek McKinnon, an Australian temporarily in the UK, and 11 of England's best players (see group photo) in the final list of entrants. Phase 1 of the tournament was a six-round Swiss, with the top four qualifying for the semi-finals and the rest playing off for the minor placings. 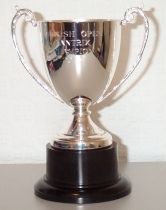 The Swiss system, which in successive rounds pairs players on similar numbers of points in an attempt to 'pyramid' out the top players, is far from perfect for Tantrix, but seemed appropriate given the awkward number of entrants, the limited amount of time and the need to ensure that everyone would get a game in every round. Top seed Tom McCoy was held up on the train and arrived late, but survived the resulting reduction in his time limit in Round 1 and hardly looked back at all after that. Indeed, online strength seemed to translate well into table Tantrix strength because all seven players seeded in the top half won their Round 1 matches except no. 2 seed Kevin Scott who was held to a 20-20 draw by a fast improving Tracey Fletcher. Marion Scott took the lead with the biggest win, 28-11 over Sharon Hood, Carl Crook followed close behind after a 25-17 win against Matthew Reid and Derek McKinnon broke the record for the lowest tile score in a tournament game as he lost 11-8 to Simon Wright. 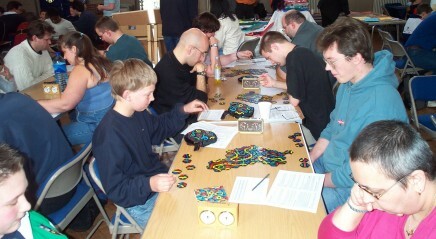 The games in Round 2 were less clear-cut, with everyone concentrating hard as you can see in the pictures above. The 20-minute time limit had not seemed to cause any problems for the players in Round 1, but became a more important factor once the strongest players started playing each other and the games became tighter and more complex. Only William Brooks seemed never to find the time limit a problem, finishing his games first in almost every round no matter whom he was playing against. In Round 2 he was playing Kevin, one of the slowest players in the tournament (you can just about make out the times on the picture above left) who just managed to stay within the limit as he won the game 27-23. The most exciting game in Round 2 was also the longest, with both Mauro Lazzara and Tom in deep time trouble as they finished off a hard-fought 21-21 draw on table 2 - see right. In the end, Tom's flag did fall, giving Mauro 11.0 TPs to his 9.0. Sharon Hood dropped a time penalty too against Matthew Reid on table 7, but it was worth it as she made sure she won the game 36-18. With Simon unable to overcome Tracey on table 4 as she achieved a second draw in a row against a top player (though he did rise one place to 5th) and William having lost to Kevin on table 3, there was amazingly only one player with two tile wins in the first two rounds! That was Marion Scott, who had beaten Carl Crook 18-12 on the top table and was looking very strong. The last round before lunch was a bad one for the Scott family on the top two tables. Marion lost her 100% win record to Mauro, who won 29-20 to move into 1st place on 42.3 TPs, and Kevin dropped to 7th when he lost another long game 26-16 to Tom. Tom moved into 2nd, 1.6 TPs behind Mauro. Simon beat Carl 19-18 to take his chance to move up into the top four places. In fact he was now 3rd, 3.1 TPs behind Tom and just 0.8 TPs ahead of Marion. Tracey continued her good run of form against William, taking advantage of a 'long' blocked game (see left) to record a 16-13 win and move up from 8th to 6th. Tournament débutant Steve Lugton won his game against Sharon Crook by a bigger margin to move into 5th, up from 9th, just ahead of Tracey. Derek started to climb up from 12th with a narrow 18-16 win against Sharon Hood (who lost a second successive time penalty too) and Matthew Reid managed his first win since he had learnt to play Tantrix a couple of hours earlier, 24-19 against Bethany R (u). After lunch, Radio Cambridgeshire's listeners got to hear about the progress of the tournament as the station conducted a live interview with one of the MSO organisers as he sat surveying the hall. Things were getting serious, especially on the top four tables - see below. Tom cut the gap between 1st and 2nd to just 1 TP with a hard fought win on table 2 over Marion, who now slipped behind Simon into 6th. The tournament's surprise contenders for SF places, Tracey and Steve, were paired on table 3 (the main game in the pic on the right) and Steve won 24-17 to move up to 3rd, about 6 TPs behind the top two. Kevin moved up three places to 4th with a 23-12 win over Carl on table 4. William returned to winning ways on table 5, his 22-18 win over Derek lifting him one place to 8th. Sharon Crook's big 34-20 win over Matthew on table 6 lifted her no less than five places to 7th and 8-year-old Bethany beat Sharon Hood 27-18 on table 7 to ensure that all 14 players would end up with at least one win. All players had won and lost at least one game by the end of Round 5, as Mauro's unbeaten run came to an abrupt end on the top table against Kevin (below left), who beat him 34-22. This left the way clear for Tom to take over in 1st place, even though he was held to an 18-18 draw on table 2 by Steve. Tom now led the field on 66.0 TPs with Kevin 4.7 TPs behind him after jumping two places to 2nd. Mauro in 3rd and Steve in 4th were both within 1.1 TPs of Kevin though. 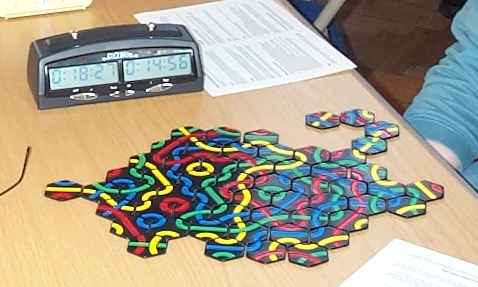 However, the real drama in this round occurred in the game between the 5th and 6th placed players on table 3 (above right), with Simon almost completing a line long enough to win the game before realising to his horror when the endgame was reached that the BBR tile he thought he was about to force Marion to play to complete the line was actually a RBB and the connection he needed was blocked, so Marion won the game 26-24. Understandably upset given the implications of his oversight for his chances of qualifying, Simon must have thought his chances of making the SFs had gone as he dropped to 8th, with Marion staying in 6th. Meanwhile on table 4, Sharon Crook scored her second big win in succession, 29-19 against William, and now she too was in contention in 5th place, less than 3 TPs away from the qualifying places. Tracey beat Matthew 26-23 on table 5 to keep herself in with a small chance of qualification in 7th. At the start of the final Swiss round (possibly one round too many, since it was the first round where players had to be paired with those who were not that close to them in the table), Tom in 1st place looked fairly certain to qualify, but Kevin, Mauro and Steve were still in danger unless they could win their Round 6 games. Lower down, all kinds of permutations were possible ... indeed, a remarkable set of results would lead to none of the players in 5th-8th at the start of the round ending up in the 5th-8th place classification matches and no one in 9th-12th at the start of the round ending up in the 9th-12th place classification matches! On the top table, Tom ended Tracey's hopes and his narrow 28-25 win actually knocked her down to 10th, so close were things in the middle of the table. Tom finished 1st on 80.3 TPs and Simon ticked off one result in his head. Kevin beat Sharon Crook too, 29-22 on table 2, to finish on 76.8 TPs. This was enough to keep him in 2nd just 0.6 TPs ahead of Mauro after the latter beat Steve 18-26 on table 3 to knock him out of the top four by just 0.6 TPs, or about 3 tiles. All eyes were now on table 4 and with three short disconnected lines, it was not looking good for Marion. Trying as hard as she could for the win she needed, she used up a lot of thinking time and her flag had fallen even before the endgame started. A relieved Simon smiled as Derek headed for a 15-13 win and the last piece in his qualification 'jigsaw' looked like it was slotting into place. But ... Marion's clock was ticking onwards and if she gave away four time penalties, Derek would go ahead of Simon by just 0.3 TPs. In the end though, she went over time by less than three minutes and Simon was through. Derek finished 6th, 0.1 TPs behind Steve. With Carl and William having scored big 40-17 and 42-22 wins against Bethany and Matthew to climb from 10th and 11th to 7th and 8th respectively, the unfortunate Marion (the no. 3 seed who had of course led for the first two rounds) ended up falling five more places to an unlikely 11th! Looking at the final table, it becomes clear why such huge changes in position were able to occur in the last round - the middle 8 players ended up with 3 wins (or equivalent) out of 6, with the players in 4th and 5th finishing there because they each had a draw to add to those wins. The semi-finals pitted 1st & 4th and 2nd & 3rd in phase 1 against each other, with the higher-ranked player from the Swiss phase destined to go through if either game was drawn. Simon's bid to emulate the GB curling team in the Winter Olympics (i.e. finishing 4th or below, scraping into the SFs, then winning the gold medal ...) was brought to an abrupt end by the now very dominant no. 1 seed Tom who beat him 42-20. The other SF was closer, but no. 2 seed Kevin prevailed by 22-17 over Mauro, whose sparkling early form seemed to drop off towards the end of the day. In the classification SFs, William (8th in the Swiss) beat Steve (5th in the Swiss) by 31-16 to ensure that he would move up at least two places and Derek shaded his game against Carl by just 19-17 to take the other place in the game for 5th-6th. Sharon Crook won the battle of the Sharons 18-15 to play for 9th-10th against Marion, who recovered from the disappointment of the final Swiss round to beat Tracey 22-16. Matthew won both games against Bethany to finish 13th, reversing their places from the Swiss phase, Tracey beat Sharon Hood 36-21 to finish 11th and Marion regained another place by beating Sharon Crook 27-18 to finish 9th, with Sharon herself completing the top 10. Carl came 7th with a huge 62-19 win over Steve, a 31-tile loop (see right) which completed around a hole in the endgame! Derek beat William 21-19 to claim a top 5 place, having lost to him 22-18 in Round 4 of the Swiss phase. William's recent rivalry with fellow 12-year-old Simon in the quest to overtake him as the youngest player ever to reach 950 in the lobby rankings was then put aside temporarily. This was because if Simon beat Mauro to finish 3rd, Simon would win a top 3 prize and the prize for the top U18 not winning a senior prize would then revert to William. Simon obliged, beating Mauro by 26-20 after having lost to him 20-16 in Round 4, though Mauro will almost certainly have ended up with a slightly better record measured over all 8 rounds. 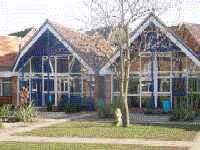 The two top seeds met in the Final, with Tom playing green and Kevin playing blue. They had also met in Round 3 of the Swiss phase, when Tom had won 26-16. Having finished higher in the Swiss phase, Tom played the first tile and only needed a draw to become the first British Open Tantrix Champion. Tom threatened a large loop and late in the middle game (below left), it looked like he might complete it. However, there were two indirect corner links left to fill and Kevin was building quite a long line himself, so both started thinking hard. Three minutes later, Tom was still thinking hard and Kevin was beginning to drift off to sleep :-) (above right) but in the end he filled the missing link nearest him, having decided that this would otherwise be the easier link for Kevin to block. This left Kevin trying to find a way to block the other link. He did his best, but Tom had calculated correctly and got hold of the tile he needed to complete the loop. Kevin could only extend his line to 30, so Tom won 36-30 - see picture below right. Kevin said that he had been worried that he would not complete the game within the time limit and thought he had made it by 4 seconds in 14:56. This worried Tom, who had taken 18:27, but it turned out that the digital clock on the top table had thrown Kevin into thinking he was playing online and the time limit was 15 minutes instead of the 20 minutes it actually was for this table tournament! Would a bit of extra thinking time have helped Kevin to prevent Tom's loop? Probably not, but now we will never know. We decided to drag the winners up onto the stage to receive their prizes, which turned out to be a good idea because they were noticed and applauded even by those who had been playing other games in the hall. 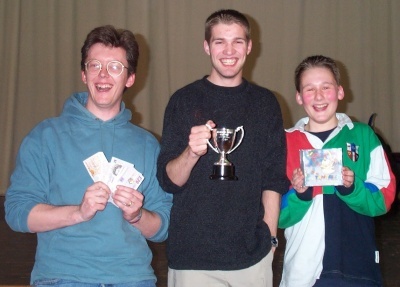 Tom received a silver cup, £20 and the title of British Open Tantrix Champion 2002, Kevin received £9 and a Tantrix CD-ROM (he seems to have got hold of Tom's prize money too for the picture below!) and Simon received a CD-ROM for 3rd place. William won a CD-ROM too for being the top U18 outside the top three - he later went on to win the junior Go contest and do well in a couple of other events, walking away with the 'Grantamind' title for the best performance at the MSO in three or more events. As you can tell from the happy faces above, the tournament was a big success with everyone seeming to enjoy themselves, even if most finished the day exhausted! Plenty of people saw Tantrix for the first time too, most going away impressed (some even having bought sets for themselves) and it is not often that Tantrix is mentioned on children's television, on local radio and in the press all in the same week. The Tantrix players were a very nice bunch of people to run a tournament for and those who meet them online in the Tantrix lobby should be pleased (or should that be 'shocked'!) to learn that in reality they are all very much like they seem online! You can see a picture of all of the entrants here. 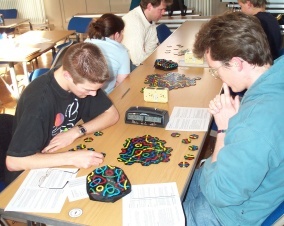 It was very noticeable that while many of the players were very competitive, they were very sporting too - the frequent inadvertent illegal moves were spotted and sorted out without any need to call in the controllers and the number of time penalties was agreed without any disputes even when using non-digital clocks. Probably not something we can rely on for the future if table tournaments get bigger and more international, but a very good sign nonetheless. Twenty minutes seems to be the right time limit for a table tournament too - most of the games finished in the last 10 minutes of each session and six time penalties were given up in total in the 42 games. In fact, the most unexpected thing that happened was that this was a northern hemisphere Tantrix tournament which went almost exactly according to the seedings (seeds 1 and 2 finished 1st and 2nd and seeds 4 and 5 finished 3rd and 4th) - even more surprising when you consider that in this tournament, only one game was played against each other player whereas the multiple 'upset' results in the last two European Championships (in both of which an unseeded player reached the Final) occurred in longer all-play-all groups and in multi-game knockout matches designed to reduce the effect of the luck factor!